In the initial installment of Money Man our hero helped a family withstand pressure from noted automobile personage, The Closer. In this installment Money Man helps a consumer deal with another car lot personage, The Finance Guy. The Finance Guy may not exert the high pressure of The Closer but he can still do some long term damage to your finances. If a family has credit card debt, is upside down in their current vehicle or both having credit cards paid off or negative equity in an old car applied on a new car loan can be very appealing. Still, long term if a consumer is serious about getting out of debt it’s a losing proposition. Often The Finance Guy will talk about amount of payments rather than the total being paid. An expression sometimes used is “payment shopper.” A payment shopper is primarily concerned with the monthly payment as opposed to the overall cost of a vehicle. There is an underlying danger with that. 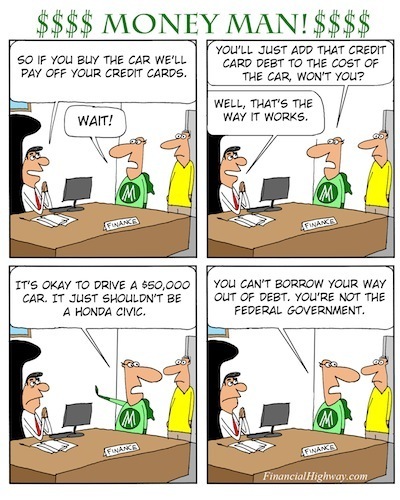 If a consumer has credit card debt there’s usually a reason for it. If that reason is not addressed and credit card debt is tacked on to a car loan not only will the consumer be paying off the debt under the guise of a car loan, the credit card debt could very well creep back and the consumer will be under an even heavier debt load.